Difference between revisions of "Miami and Erie Canal"
The Miami and Erie Canal was one of Ohio's most important canals during the mid nineteenth century. During the late 1810s, Governor Thomas Worthington and Governor Ethan Allen Brown both supported internal improvements, especially canals. Both men believed that Ohioans needed quick and easy access to the Ohio River and to Lake Erie if they were to profit financially. Farmers and business owners would be able to transport their products much more easily and cheaply with canals rather than turnpikes. Canals would also possibly open up new markets for Ohio goods. In 1820, Brown convinced the Ohio legislature to establish the Ohio Canal Commission. Its purpose was to hire an engineer to survey a route for a canal that would connect Lake Erie with the Ohio River. The formation of the board was conditioned on the United States government either donating or selling land to the Ohio government for the canal. The United States government refused, and the Ohio Canal Commission did not complete a survey. In 1822, the Ohio legislature realized the importance of internal improvements and created a new Ohio Canal Commission. The Commission hired James Geddes, an engineer who had worked on the Erie Canal in New York, to determine the best routes available for a canal from the Ohio River to Lake Erie. Geddes proposed three routes. The first ran along the Miami and Maumee Rivers in western Ohio; the second included the Scioto and Sandusky Rivers in central Ohio; and the final route included the Muskingum and Cuyahoga Rivers in eastern Ohio. The Canal Commission eventually recommended a route starting at Lake Erie, passing through the Cuyahoga Valley, the Muskingum Valley, the Licking Valley, and then to the Ohio River along the Scioto Valley. In essence, this first proposed route included a combination of the central and eastern Ohio routes. The Commission also recommended a western route along the Miami and Maumee Valleys. In 1825, the Ohio legislature approved both routes, and work began immediately. On July 4, 1825, at Licking Summit just south of Newark, Ohio Governor Jeremiah Morrow and New York Governor De Witt Clinton, the man most responsible for New York's Erie Canal, turned over the first shovels of dirt of what would become the Ohio and Erie Canal. On July 21, work began at Middletown on the western canal route. This canal became known as the Miami and Erie Canal. To finance the canals, the Ohio government relied on loans. The legislature established a Canal Fund Commission to regulate the costs of and the securing of money for the canals. Ohio received its initial loan for construction of the canals from bankers and businessmen living along the East Coast. The initial loan was for 400,000 dollars. 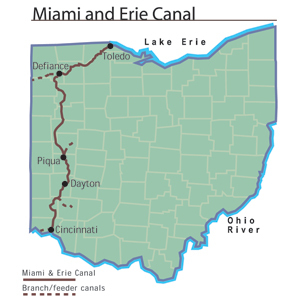 The canal commissioners estimated that the Ohio and Erie Canal would cost approximately 2.3 million dollars, while the Miami and Erie would cost 2.9 million. Once construction was completed, the canals combined actually cost 41 million dollars, 25 million dollars of which was interest on loans. The Ohio and Erie Canal cost approximately ten thousand dollars per mile to complete, and the Miami and Erie Canal cost roughly twelve thousand dollars per mile to finish. The canals nearly bankrupted the state government, but they allowed Ohioans to prosper beginning in the 1830s all the way to the Civil War. Canal construction went quickly but not easily. At the peak of construction, more than four thousand workers were laboring on the canals. Private businesses bid on portions of the canals. The state usually accepted the least expensive bids. Once the trench for the canal was dug, workers usually lined it with sandstone. Canal locks also usually consisted of sandstone lined with wood, but sometimes workers made the locks exclusively from wood. The submerged wood would swell, making a waterproof barrier. Workers generally earned thirty cents per day plus room and board. A typical day began at sunrise and did not end until sunset. While thirty cents per day seems a poor wage in modern money, it was attractive to numerous people. Many recent immigrants to the United States, especially the Irish, survived thanks to jobs on the canals. Other people, like the residents of the communal society at Zoar, also helped construct canals to assist the survival of their community. Many of Ohio's communities today, including Akron, began as towns for the canal workers. By 1833, the Ohio and Erie Canal was complete. The Miami and Erie Canal would take an additional twelve years to finish, because the state legislature only originally authorized its completion from Cincinnati to just north of Dayton. In 1830, the Ohio legislature earmarked funds for the Miami and Erie Canal's extension to Defiance and Lake Erie. Once completed, thirty-three of Ohio's eighty-eight counties either had portions of canals running through them or quarries to mine rock for construction. Once completed, the canals still faced numerous difficulties. Flooding could do serious damage to the locks, walls, and towpaths, requiring extensive repairs. Especially in northern Ohio, cold weather would cause the canals to freeze, also causing damage. Usually canals in the northern half of the state were drained dry from November to April. During the winter months, workers would repair any damage that occurred during the earlier part of the year. In southern Ohio, canals generally stayed open the entire year. The difficulties Ohioans faced with the canals paled in comparison to the advantages that they garnered. Most importantly, the cost to ship goods from the East Coast to Ohio and vice versa declined tremendously from 125 dollars per ton of goods to twenty-five dollars per ton of goods. It took eighty hours to travel from Cleveland to Portsmouth along the Ohio and Erie Canal. While horseback was much quicker, it also cost a great deal more. The cost on the canal boat was $1.70 per person.